Solar Electricity does not have to be complicated. However, becoming a PV system owner does require a basic level of understanding. This article is a good place to start. When people think about alternative or renewable energy, the first image that comes to mind is often large blue or black solar panels on rooftops or portable highway signs that have a small panel attached. These solar panels, also known as photovoltaic modules (or PV modules), convert sunlight into electricity, and they have been the backbone of renewable energy for decades. The Photovoltaic Effect (how sunlight is converted into electrical energy) was discovered over a hundred years ago! Yet widespread implementation of this technology has been very gradual. Only in very recent years has photovoltaics gained wide popularity as an alternative way to produce electricity. In 1958 the first PV modules were launched into space to power satellites. Even today, solar power is the primary source of energy at the International Space Station. On Earth as well, PV has traditionally been used in areas where there is no practical source of electrical power but there is abundant sunshine. Solar panels are often used for remote applications: like powering cabins, RVs, boats and small electronics when grid service is not available. Recently, “grid-interactive” solar electric systems have started gaining momentum as a cost-effective way to incorporate solar electricity into our everyday lives. Now we can take advantage of available solar energy while still enjoying the safety net of the utility grid. In very basic terms, a solar panel (PV module) is a device that will produce a flow of electricity under sunlight. This electricity can be used to charge batteries and, with the aid of an inverter, it can power normal household electrical devices, or "loads". PV modules can also be used in systems without batteries. Most solar panels (properly called "modules") are framed in aluminum, topped with tempered glass, and sealed by a waterproof backing. Sandwiched between the glass and backing layers are the photo-reactive cells themselves, often made of silicon. On the back of the module is a junction box that may or may not have two cables coming out of it. If the junction box has no cables, it can be opened to access the electrical terminals where wires can be attached to conduct the generated electricity away from the module. If there are cables already in place, the junction box is usually sealed and not user-accessible. Sealed junction boxes are more common. There are lots of ways to make use of solar electricity. One of the simplest is to charge small electronic devices, like cell phones and music players, with lightweight, portable PV modules. Solar panels can be used individually or wired together to form a solar array. For larger electrical loads, there are two main types of systems for providing electrical power to homes, cabins and offices, etc: stand-alone battery based systems (also called 'off-grid' systems) and grid-tied systems (also known as utility-interactive). You’ll want to decide which system is best for your needs by reading more about both. Monocrystalline solar panels are often the most expensive due to the manufacturing process, which uses large amounts of highly purified silicon and a great deal of energy. Monocrystalline solar cells are about 13-16% efficient at converting sunlight to electricity. Polycrystalline cell efficiencies range between 11-14% so polycrystaline solar panels are slightly less expensive than monocrystalline ones on a price-per-Watt basis. String ribbon solar panels use less silicon in the cell manufacturing process than the other crystalline types and achieves efficiencies in the 12-14% range. Amorphous solar panels, or thin-film amorphous silicon, A-si, are not constructed from individual cells, but are made by depositing a photo-sensitive compound onto a substrate. While these solar panels have lower efficiencies, (usually 7-10%), they offer certain advantages. They can often be used in hotter climates since they suffer less power loss than other types under hot conditions. Additionally, the amorphous technology does not use the typical “glass sandwich” construction, allowing for the creation of flexible solar panels which are also very durable. The CIGS technology, or Copper Indium Gallium di-Selenide, uses no silicon at all, and can be made into panels with or without discrete cells. There are also hybrid solar panels which use both crystalline and thin-film technologies to increase energy capture; these modules boast efficiencies up to 19%. Researchers are still working on lower-cost, higher-efficiency alternatives, but for the foreseeable future, these five types represent what is commercially available. PV panels produce DC, or direct current electricity. This is the same type of electricity that is produced by your car battery or other batteries. The appliances in our homes use a different type of electricity called AC), or alternating current. DC electricity flows in one direction only, while AC electricity changes direction rapidly, offering certain advantages in transmission (greater distances through smaller wires). In order to use solar electricity to run normal household devices, you’ll need an solar inverter, which converts DC to AC. A small system to charge batteries or power small electrical devices (like cell phones and personal music players) doesn’t require an inverter, but be sure to use the correct adapters and, if needed, voltage converters or limiters. So now, let's look at these values in terms of energy and power. In the car analogy, the odometer counts the quantity of miles traveled. Your electric utility bill shows the number of kilowatt-hours (kWh, or 1,000 Watt-hours) you use per month. So how does the wattage rating of a solar panel affect the amount of energy the panel produces? Simple-- with all else being constant, a higher-wattage solar panel will produce more energy over time than a lower-wattage panel. A 100 Watt solar panel will produce twice as much energy as a 50 Watt solar panel at the same location during the same period of time. It’s worth mentioning also that solar modules’ wattage output rating is based on what the modules produce under laboratory-controlled conditions, called Standard Test Conditions (STC). STC allows solar panels to be compared to each other using the same metric. However, because these rated wattages represent ideal laboratory conditions, it's likely that the module will produce lower wattage in actual use. PV modules also have and ratings. The rated wattage of a panel is equal to its operating voltage multiplied by its operating current: Watts = Voltage x Amps . The amount of energy in Watt-hours that a panel will produce is a product of the wattage of the panel and the number of hours of full-intensity sunlight, or , that it receives. For example, a solar panel that outputs 100 Watts for two hours will produce 200 Watt-hours of energy. Insolation values are also tied to STC and are based on location. They can be found in data tables for most locations in the U.S. and the world. The actual number of Watt-hours a panel produces will very likely be less than this theoretical value due to many factors that affect the efficiencies of the system components. There are standard factors used to correct for real-world energy losses, but our present focus is the basic electrical principles. PV modules have three different voltage ratings that it’s handy to understand. Nominal Voltage : The nominal voltage of a panel could also be called the “conversational voltage.” When we talk about the voltage of the panels and the other components of the system, we’ll most often use the nominal voltage. Nominal voltage actually refers to the voltage of the battery that the module is best suited to charge; this is a leftover term from the days when solar panels were used only to charge batteries. The actual voltage output of the panel changes as lighting and temperature conditions change, so there’s never one specific voltage at which the panel operates. Nominal voltage allows us, at a glance, to make sure the panel is compatible with a given system. Voltage at Maximum Power or Vmp : This is the highest voltage the panel can produce while connected to a system and operating at peak efficiency. Open Circuit Voltage or Voc : This is the maximum voltage that the panel can produce when not connected to an electrical circuit or system. Voc can be measured with a meter directly contacting the panel’s terminals or the ends of its built-in cables. Panels also have two different current ratings: (Imp) and (Isc) , both listed in Amps. The maximum power current is similar to Vmp: it’s the maximum current available when the panel is operating at peak efficiency in a circuit. Similar to Voc, the short circuit current is the current measurement your meter would show when in contact with the positive and negative terminals of the panel while not connected to a system or load. All these electrical characteristics are used to help determine the size of the PV system and components. These specifications can be found on the label on each solar module as well as on manufacturers’ specification sheets. There are two main types of connectors on the backs of PV modules. Solar panels rated at less then 100 Watts, or modules manufactured more then ten years ago, often have openable junction boxes. 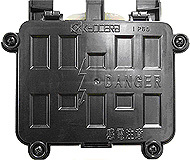 You can connect wires to the positive and negative terminals of the panel by passing them through knock-out holes in the sides of the junction box. The other type of connector consists of a sealed junction box with wire leads, usually two to three feet in length. In a small number of cases the wires have bare ends, but the majority of modules made today have MC or Multi-Contact brand connectors at the ends of their wires. 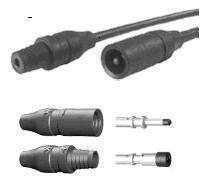 MC connectors come in several styles, the two most common of which are often called MC4 and H4. Location of the PV panels is critical to their energy output. A solar panel installed in Florida will produce more energy over the course of a year than an identical panel installed in North Dakota. Places closer to the equator will get more sunlight (also referred to as irradiance) throughout the year than places further north or south. The more irradiance striking a PV panel, the more electrical energy it will produce. Another factor that will affect the electrical output of your array is the directional orientation of the modules. When choosing a location for your garden, you know that a southern exposure will increase yield. So with solar panels: they perform best when facing due south to get maximum exposure as the sun travels from East to West. If you are using a compass to find south, make sure to adjust for magnetic declination, which varies with location. The of the array will also affect power output. In the Northern Hemisphere, a tilt angle equal to your latitude will yield the best year-round production. A tilt angle equal to your latitude minus 15 degrees will favor summer production, while an angle equal to your latitude plus 15 degrees will favor winter production. Shading – Don’t let it happen to you! One of the biggest environmental factors affecting solar electricity production is shading. PV modules are very sensitive to shade. For example, if shaded by as much as a leafless tree branch, a PV module could lose up to 80% of its output. When selecting a site for your installation, choose one with the least possible shade during the hours between 9 AM and 3 PM. Consider things that may possibly shade the array during different times of the year as the sun travels higher or lower in the sky. A location that, in June, doesn’t get any shading, may be shaded for a significant part of the day in December. A Solar Pathfinder is a useful tool for determining the optimal location for solar production. Plan on your PV panels producing power for more than 20 years. Young trees might not be an issue today, but as they grow they may become a source of shade. PV modules are only one component in a solar electric system. Check out some of our other articles to find out more about the other components you’ll need for your system. Remember that electricity is dangerous and can be lethal. Review the National Electric Code Section 690 for information on installing a code-compliant system. Read over John Wiles’s Photovoltaic Power Systems and the 2005 National Electrical Code: Suggested Practices. If you’re designing a large system, make sure to contact your local electrical inspector prior to the installation.